I can remember the first time, being around 1985, when I saw a Michael Taylor painting and can recall the effect it had on an artwork I was doing at the time. Since then I have engaged with Michael’s work only on occasions. But all those sightings of his paintings had not quite prepared me for the impact of the survey exhibition now at the Canberra Museum and Gallery (CMAG) till Sunday 2 October 2016. This is an exhibition for those who love country, who like to experience landscape and who want to enjoy the works of one of Australia’s great painters. I totally recommend this CMAG exhibition and also suggest that you not only allow enough time to take it in – but that you return to enjoy the experience again as it is amazing what you see the second time – and then the third time. Michael Taylor is not an abstract expressionist – as some people have mistakenly classified him. Yes, he uses abstraction – but there is so much more to his approach to his art. What is very evident from this exhibition is that Michael Taylor is one of the wonderful people who are of the country that they live in or that they are visiting. He experiences the atmosphere and the ambience of landscape. The mix of those two elements is what this exhibition is about. There is some really good stuff in this exhibition! Unlike others who like to list their favourites as if they think this is a “Master Chef’ competition, the real joy is in seeing all the individual works in the context of this whole survey. Yes – there are a few I would love to take home – but I am not going to tell you which ones they are. His painting style is about the application of paint, the gestures involved and the energy that a painter exudes when they attempt to portray their experiences. Michael has used abstraction to provide clues of the experiences he has had with the landscapes and other earthy matters (floods, animals, and even the occasional person), traces of which are contained within the works. The exhibition is a survey exhibition of a long career as an artist – Michael is now 83 – and he is still painting. I sense there is quite a few years to go with this artist’s career. What has struck me each time I have been in to see the show is how he is introducing the visitor to the landscape that he has been part of his life since the early 1970s. And that country is the Monaro Region – you know that place that people drive through to go somewhere else! 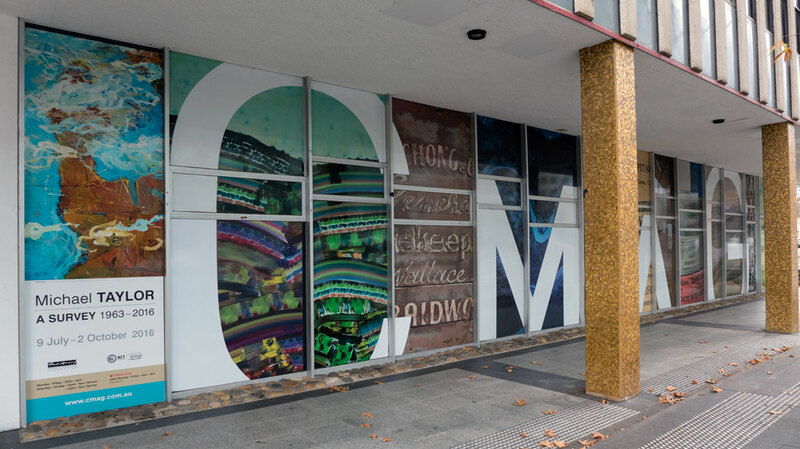 What Michael Taylor – and his artworks – is telling us is that the Monaro is a place of beauty if you take the time to observe how it changes with the weather and at various times of the day. While Michael Taylor has had a long career it seems that for some reasons he has dropped slightly from the every day radar of those who write and talk about the visual arts in Australia. This has been a shame both for the artist and for people who enjoy getting along to see great Australian artworks. Well! Thanks to Deborah Clark (curator) at the CMAG, we now have the chance to see a whole mass of Michael’s artworks together in one room. The survey starts early in his career in Sydney and then travels through various places he has visited included South Australia and the South Coast of NSW. The major emphasis is on his home country – being the Monaro. And there is one paining completed in 2016. This is one of those exhibitions that really demonstrate the power of having a good regional gallery in your town. I think there is a lot more to be done to bring out artists who have the Monaro as their theme. The landscapes of this corner of the country are often overlooked. By the way, Michael Taylor is also well known for his watercolours. There’s a few of these tucked away in a corner in this exhibition. I would suggest that the CMAG could do a follow-up to this painting survey with a full on exhibition of Michael’s water colours. That would be some exhibition! Again – I recommend this survey exhibition of Michael Taylor’s paintings. I look forward many more exhibitions of this calibre from the CMAG. Congratulations Michael Taylor – and well done Deborah Clark. By coincidence I happen to be reading a wonderful little book – by John R Stilgoe – Outside Lies Magic – Regaining history and awareness in everyday places. This is about the ‘acute observation of ordinary things, about becoming aware in everyday places, about seeing in utterly new ways, about enriching your life unexpectedly’. I suspect Michael Taylor already knows about this stuff.